Based on the principles of the macrobiotic diet -- a diet centered on simple eating and abstention -- the seven-day brown rice diet is a cleansing diet aimed at helping your body rid itself of toxic substances. Although the diet is called a brown rice diet, you are allowed to eat other foods. While it is less restrictive than most detox diets, it may not be any more effective. Consult your doctor before making changes to your diet. The seven-day brown rice diet is described as a whole-foods diet, and you are not allowed to eat any processed foods during the weeklong period. You're allowed to eat organic brown rice, millet or quinoa; any raw, steamed or baked vegetable with the exception of corn and mushrooms; raw fruit except oranges, bananas and dried fruit; olive oil or flaxseed oil; and fresh ginger; garlic and tamari. Free-range chicken, ocean-going fish such as salmon or tuna, tofu, legumes and walnuts are also permitted. You're advised to eat five to six small meals during the cleanse and to eat enough to satisfy your appetite without overeating. Fresh fruit and drinks, which include filtered water and fresh fruit juice, are taken separately from meals. Everyday life causes your body to accumulate damaging toxic substances, according to naturopathic doctor Julie Zepp Rutledge. The seven-day brown rice diet is nutrient-rich and assists your body in eliminating these toxic substances, while improving digestion, decreasing disease symptoms and controlling cravings. After completing the cleanse you will feel revitalized and renewed, the doctor goes on to say. 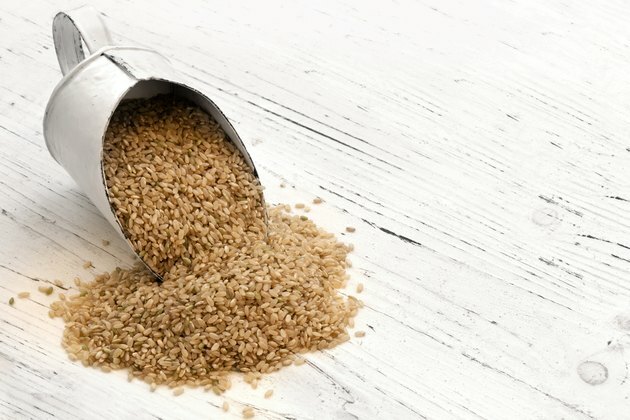 Overall, the seven-day brown rice diet includes a variety of healthy foods from most of the major food groups, with the exception of the dairy group, which may effect your calcium intake if you're not including enough leafy greens or tofu. However, as a diet with a list of good foods and bad foods, the seven-day brown rice diet is considered a fad diet, which may make it difficult to follow long term. Additionally, the diet also suggests you not eat certain foods at the same time, including fruit and drinks, because it may interfere with digestion. There is no scientific research that food-combining affects digestion and health, according to the University of Pittsburgh Medical Center. There's no evidence to support that any diet regimen or combination of foods improves your body's ability to detox itself, according to a 2008 article published in Today's Dietitian. Healthy kidneys and liver naturally detox your body, which eliminates the damaging substances through urine, stool and sweat. While a detox diet like the seven-day brown rice diet may help jump-start a healthy eating plan, it is not recommended for people with chronic illnesses or teens. KidsHealth: Are Detox Diets Safe? Can You Drink Coffee on the Cabbage Soup Diet?